On the weekend, 43 KHL players from 19 KHL teams lined up in Sweden for the Beijer Hockey Games, the third stage of this season’s Euro Hockey Tour. For the first time this season, Team Russia conceded an EHT stage as the Czech Republic got two early wins over Sweden and Finland, before losing to Vorobyov’s team on Sunday thus finishing the tournament with six points. Once again, KHL players played a significant role for all the teams. This time around, the Lions had a bit more of a hard time in the tournament and finished the Beijer Hockey Games at the last place after winning only one game – a SO win on Sunday against Sweden. Only Ville Pokka and Joonas Nattinen had one point among KHL players. Mikael Ruohomaa didn’t score, while Iiro Pakarinen and Jukka Peltola didn’t make the final roster. It is expected that the KHL men will have a more prominent role in the Euro Hockey Tournament’s next stage. Once again, the Tre Kronor finished the tournament on third place, mostly thanks to a solid 4:2 win over Russia on Saturday. Metallurg’s forward Dennis Rasmussen had a good performance, and with three points in three games he was tied at second in Sweden’s top scorers list. Rasmussen racked up a pair of helpers in the losing effort against Finland on Sunday. In the same game, also CSKA’s Klas Dahlback had an assist, and he finished the tournament with two points – the best result among Sweden defensemen. Philip Holm was as usual excellent on the blueline for the Tre Kronor and had a point in his only two games. Jokerit’s Viktor Loov produced no points in his two games, but he finished the tournament with a plus-2 rating. SKA’s Magnus Hellberg allowed four goals to the Czech Republic in the tournament’s first round. After a couple of disappointing tournaments, this time around the team led by Milos Riha pushed the gas and mathematically guaranteed themselves the first place in the standings already on Saturday. Ex-Metallurg forward Jan Kovar and Ak Bars’ Jiri Sekac were the top players for the Czechs, even if they played only two games in the tournament and missed the final game against Russia. Amur’s Tomas Zohorna was also very good for the Czechs as he had one goal and one assist. Neftekhimik’s defenseman Adam Polasek and Amur’s blueliner Marek Hrbas posted no points for the Czechs, who will host the next Euro Hockey Tour stage. The Russians were probably the team to experiment more with their roster, but they had a good tournament, wrapping up a second place. Avangard’s Ilya Mikheyev stole the show, scoring three goals and ending up as the team’s top scorer. 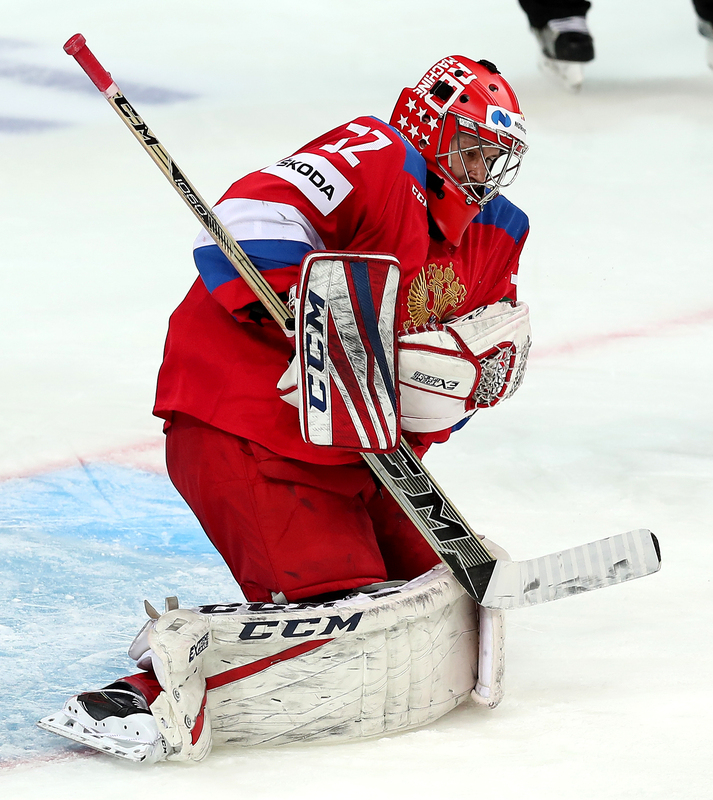 Another player who gave a great impression is Andrei Kuzmenko: the SKA forward posted a double against the Czechs, including the game-winning goal. Salavat Yulaev’s Alexander Kadeikin also scored against Milos Riha’s team, cementing his position of one of the top candidates for the IIHF World Championship in May. However, the player that impressed the most was probably the young Lokomotiv goalie Ilya Konovalov, who was awarded Best goalie honors. The netminder started in two games for the Russians, posting a solid saves percentage of 91.67% and outplaying Avangard’s Igor Bobkov. Other players who played well are defensemen Alexander Yelesin and Rushan Rafikov. The Euro Hockey Tour will move to the Czech Republic for the final stage. The Carlson Hockey Games are scheduled for May 3-5.